This 3-star hotel in Munich city centre offers comfortable rooms and a large breakfast buffet. Munich Main Station and the Hauptbahnhof Underground Station are just 200 metres away. 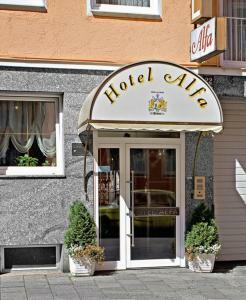 The rooms at the Hotel Alfa Zentrum include satellite TV channels, and Wi-Fi can be booked. Some rooms face the quiet courtyard. The Hotel Alfa Zentrum's breakfast buffet is provided each morning. The hotel bar offers a variety of drinks 24 hours a day. The Theresienwiese Oktoberfest grounds and the Marienplatz square are both about 1 km away. The Hauptbahnhof Underground Station provides a link to the Neue Messe Exhibition Centre in 20 minutes.